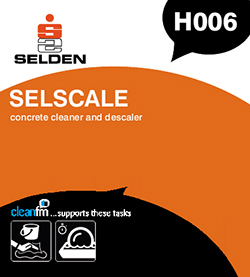 Initial cleaning and concrete etching: Dilute SELSCALE 1 part to 4 parts water. Brush or spray. Allow to penetrate 5 to 10 minutes then rinse. For stubborn deposits use neat. Descaling metal: Dilute SELSCALE 1 part to 4 parts water. Brush on. Allow to descale, rinse, allow to dry. Paint or protect from corrosion immediately. N.B. 1. Do not use on or near linoleum floors, terrazzo, marble, acid sensitive stone, stainless steel, chrome or enamel. 2. Regular use on concrete will cause deterioration and is NOT recommended. 3. Descaled metal should be painted immediately to prevent rusting.